Sweet peppers don't come in just red and green anymore—yellow orange and even purple bell peppers are fairly commonplace. 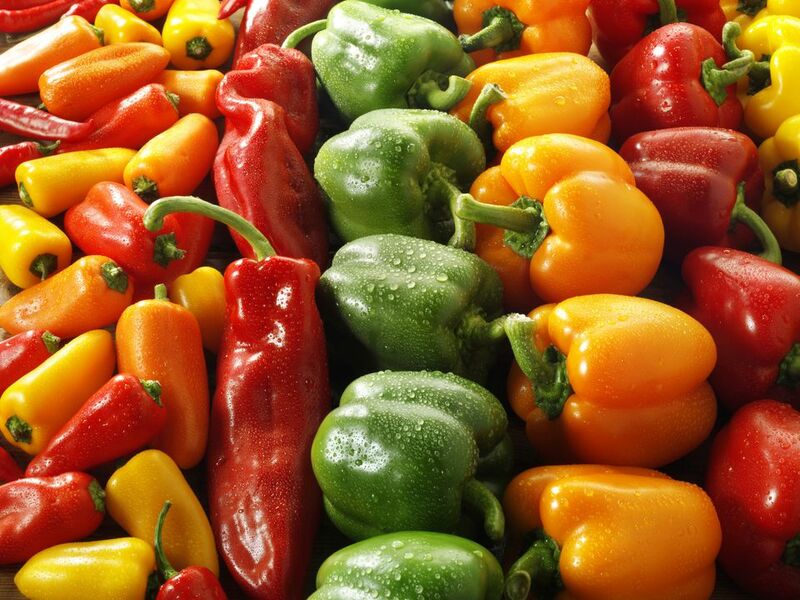 Plus, there are more kinds of sweet pepper than just different colors of bell peppers. See the rest of these slides to get a taste of the range of pepper you may come across at farmers markets and specialty stores. 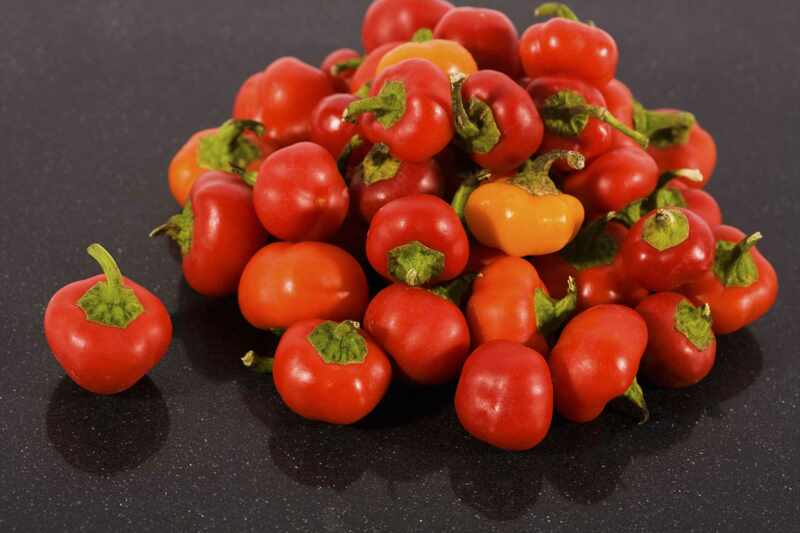 Sweet cherry peppers can be a bit spicy, but that's part of their fun. Mainly they are sweet little nuggets that taste like what they look like: condensed red peppers. They're tasty raw as a poppy little snack. They're also good in salads or pickled. These long, thin peppers are a pale yellow-green when they first grow but will darken and then turn red if left to fully ripen. Most are sold in their unripe state and used chopped as an aromatic for other dishes, or roasted and stuffed. These are the peppers we, and so many others, grew up with. They are grassy in flavor and super-crunchy in texture. We happen to like them best in stuffed peppers. Whether you decide to stuff them with ground meat or quinoa and veggies, then cook them until tender and juicy, we are sure they'll find a special place in your heart. These skinny, mild peppers are so named because they are at their best when either sliced long and thin or chopped up and gently fried in olive oil. The long, thin slices make a side dish all on their own. The chopped up ones are perfect for adding to sandwiches (best with Italian deli meats, of course!). To fry them: use a large pan over medium heat with plenty of high-quality olive oil in it. Trim the peppers (remove their stems; slice them lengthwise and remove their seeds, if you like, and add them to the pan. Sprinkle with some salt and cook, stirring now and again, until the peppers are supremely soft, about 30 minutes. Like their sunny brethren, the yellow bell peppers, orange bell peppers are a bit less flavorful than red bell peppers, but just as sweet and just as pretty. Use them raw in salads or roast them up to add their bright orange sunshine to dishes. Purple bell peppers are less sweet than red, orange, or yellow bell peppers, but they're definitely sweeter than green ones. They are perfect in salads or other raw dishes since their brilliant shiny purple color turns muddy and even a bit gray when cooked. These are the most popular sweet peppers, This is probably because they are, in fact, quite sweet. Their bright color and sweet flavor make them perfect for tossing into salads (such as this corn avocado pepper salad or this pickled bell pepper salad). Red peppers have a less grassy flavor than most peppers and become silken and luscious when roasted, a trait highlighted in this delicious red pepper marinara sauce. Yellow peppers can be used much like red or orange peppers. They are similarly sweet but have a milder taste. They roast up beautifully, just like red peppers, and keep their lovely yellow hue when cooked.